Five seasons of riding the emotional rollercoaster that is life with Nina Proudman rolled into one showreel that nearly broke the interwebs (you can play catch up on the Offspring on Ten Facebook page). Oh NEENS. We’re so ready for you to come back. I do wonder if your style will have changed in your absence. I hope it hasn’t ventured too far from the Nina Proudman style that we know and have embraced so dearly. I don’t know when Season 6 will hit our screens but I do know it’s being filmed now and I do know that some of our favourite Australian designers have been contacted by the wardrobe team … because they’ve let me know. I’ll be sure to let you know when I hear more. In the meantime, I thought I’d have a little fun and get us in the Nina Proudman-style-spirit with a 15-piece capsule wardrobe of Nina-inspired clothes. For those new to the whole Nina Proudman style phenomenon, do not adjust your device, Nina is not actually a real person. Oops, did I say that out loud? She is a popular character on an Australian TV show called Offspring – a character that very much captured our hearts. She didn’t grace our screens last year but she will again this year. Her style is not trend driven. It’s mostly casual and boho-influenced. She breaks with the boho for nights out, switching to quite classic looks. She loves knee-high boots, scarves and cross-body bags. She prefers fine, layered jewellery over look-at-me statement pieces. She rocks a kimono and skinny jean like nobody’s business. 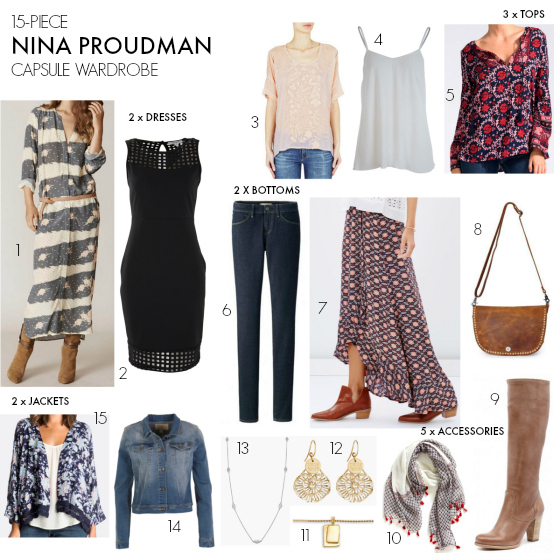 The below capsule wardrobe features a mix of Nina Proudman-inspired pieces – pieces with which she’d interchange her collection of scarves, jewellery and jackets/kimonos. Like all capsule wardrobes I put together, there is a base element of basics and a smattering of show-ponies. I’ve included a number of pieces from labels that Nina that has worn in past Offspring series. Maybe you already have similar styles to some of the above pieces in your wardrobe? Use the above suggestions to mix up how you’d normally wear those pieces. Don’t buy it unless you LOVE it. Do you work in an office? How are you looking to refresh your work wardrobe? Also a lot of the links have sold out now, and not available .. Thanks Elizabeth, I’ve checked them all and they’re all working now. I’ve changed the UNIQLO jeans one as it seems that product sold out so wasn’t going to that page any longer. Love Neenz….and her style….missed her! Oh love the style I want all of these pieces!!! That Roxy kimono looks great: not too long or too much material. Much as I love the long drapey ones, there’s a feeling of getting about in your bath robe I can’t quite get over- so I end up needing to wear a heel to counteract that feeling. I care way too much too Johanne! HAH! And I agree re kimonos … I can only do longer ones if the fabric is sheer. I actually squealed when I saw the new ad and my kids looked at me like I had two heads! I did it again when I saw your Nina inspired post on Facebook this morning! Love Nina and love, love her style. I’ve been eyeing off the Bohemian Traders top and think it will be going into my shopping cart today! I may have danced around the living room! So glad you loved seeing this post pop up … the print on that top is amazing! Oh that kimono ….. !!!!!!! It’s a great one! Not many around right now as it’s not the season for it. Soooo excited! Have been missing your posts on Nina’s wardrobe. Yes, indeed … any of the desert flower range from Bohemian Traders! That’s why I had the jacket in my shop. Ooh Nikki I can’t wait, I love offspring and Nina and from the teaser I saw on FB she still likes her boho wardrobe.